The winter of 1909 wasn’t chicago’s worst, not by a long stretch. Sadly, the relatively balmy temperatures didn’t prevent Frank A. Vanderslip’s mother from contracting pneumonia that year. Frank, who lived roughly 800 miles away in New York City, was desperate to rush to his mother’s bedside. So, on March 27 he caught a train. A June 20, 1912, edition of The New York Times reported that Frank’s journey from New York’s Pennsylvania Station to Chicago’s Union Station took 16 hours and 7 minutes—a record-setting trip that got him home in time. Today, a century later, Amtrak’s Lakeshore Limited takes two hours longer—a minimum of 19 hours—to make the NYC to Chicago run. And it costs more than the plane. With high ticket prices and long travel times, it’s a wonder why anyone would want to take an American train, but that’s exactly what I did this August. I decided to ride Amtrak’s Coast Starlight from Los Angeles to Seattle because, among other reasons, Amtrak’s press representative essentially told me not to. Anyone who’s spent a day on a train watching the world roll by, then fallen asleep to the rocking of the car and the sound of wheels on a track, knows that “the full train experience” takes more than a couple of hours to capture. I learned this during years of multi-day rail trips overseas—and on one back-breaking ride here at home. Fresh out of college, the first story I ever sold was about a ride from Tampa to New York on Amtrak’s Silver Palm, an experience I wasn’t considering repeating—until this year. When I’m overseas, I love traveling by rail. And in the many years since my first paid story, I’ve allowed myself to re-romanticize the idea of the American train. That’s why, when I needed to get to Seattle, I decided to take the Coast Starlight. I wanted to see how—or if—Amtrak’s full train experience had changed since my college days, if the purity and beauty of traveling America’s rails was readily available or, as was the case so many years ago, if that was just a romantic notion of mine. Furthermore, after the email from Amtrak I wanted to see what they were hiding. It didn’t take long to find out—though some of it was good. Great even. I could go on about the cramped, dated and somewhat dingy roomette; the fact that Coast Starlight veterans onboard complained that the train is almost always late (though ours was basically on-time); the relatively meager dining options served on plastic plates, even in the first-class dining car; Amtrak’s financial woes; its Congressional challenges; and a million other niggling bits that make the cost of the ticket seem even more fantastic than it actually is (two roomette tickets for my girlfriend and myself cost $96 more than a pair of one-way first-class plane tickets would have, and the flight is less than three hours). It would be easy to bemoan the whole trip and the entire operation as an expensive waste of time—but I can’t, because it’s not. Not really. It’s often said, and in the case of trains often true, that the journey is the destination. In the case of Amtrak specifically, it’s so true that they should write it on your ticket. My Amtrak journey began at Union Station in Los Angeles. I have to confess I’d never visited the station before—and that was a mistake. First opened in 1939, it is perhaps the last of the great railway stations built in the United States. 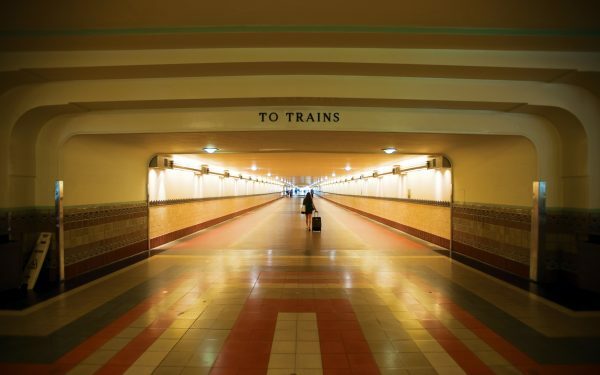 It’s stunning, and has served as a backdrop for a number of films, including 1950’s Union Station (with William Holden), Blade Runner, the American remake of The Italian Job and several others. The ornate and vast waiting area is stop No.1, and for first-class Coast Starlight passengers there’s a special meeting area with juices and coffee—no waiting in long lines. A conductor in a sharp, classically styled uniform rounded us all up and led us to the train rather than let us stumble to it ourselves, a nice touch. With the grand Deco surroundings and the well-attired and professional staff, at this point the romance of the trip was well intact. That changed upon boarding, but, as I mentioned before, I’m not going to dwell on the negative, which is basically limited to the dated rail cars and the price. Instead, I’d like to focus on the positive, which boils down to three things: the Amtrak staff, the view out of the window, and the other passengers. Fantastic. Wonderful. Professional and adept at their jobs, smiling during my whole trip. Working four-day shifts with only a couple of hours’ sleep per night, the level of service they consistently offered was all the more amazing for the challenges they face: namely, outdated equipment and the occasional difficult passenger. While we were sleeping, a refrigerator broke in the first-class parlor car, ruining a day’s food and compelling everyone to eat day two’s meals in the more basic coach diner. While this ruffled a few feathers and might have become a problem, Barbara, who managed the parlor car, handled things so well that most of us were completely unaware there was any problem at all; or at least we were so content that we didn’t care, which is as good. Likewise, the steward who looked after our bunks was attentive and friendly, offering top service, good conversation and terrible jokes in liberal supply. Every Amtrak staff member I met both in the station and on the train left me feeling good about the trip—an absolutely monumental difference from the common experience of modern air travel. At 30,000 feet going hundreds of miles per hour, there’s no sense of what’s below you. From a seat on a train, not only can you have a proper look at the country through which you’re rolling, you have the time to notice details. Museum-quality graffiti on overpasses and abandoned buildings; a smiling kid with a red balloon; people working in fields; couples holding hands in a trackside park; even someone sunning themselves in backyards hidden from street-level view. The Coast Starlight offers all of this along with a privileged view of the California coastline, namely a long stretch of the otherwise inaccessible Central Coast that lies within Vandenberg Air Force Base. It is entirely unspoiled land complete with Pacific waves crashing against tall bluffs. Seals and sea birds enjoy it all, but the only way to see this pristine area is to join the Air Force or to ride the train. By the time the Coast Starlight heads into the Pacific Northwest you’re glued to the window, Oregon’s mountain passes and lush valleys replacing the bold California coast. Washington State is as lovely, and by the time the train stops in Seattle you’re sated with visions of beauty. Equally astounding is what you don’t see out of the train windows: flashing billboards and the endless stream of advertisements that assaults motorists every minute. This fact didn’t even occur to me until weeks after my trip when I read an article about another man’s train experience (more on this below), but the novelty of it is unavoidable: the train offers an unspoiled view. While some people enjoyed watching the world roll by from their roomettes and larger cabins, most on our Coast Starlight eventually found their ways to the parlor car, a comfortable lounge-type setting that offered, among other things, that great conversation starter known as the bar. If conversation on a plane runs the gamut from forced interaction to stoic silence (with the rare good chat occasionally thrown in), the train is more like a small cocktail party on wheels with people meeting and greeting in the first hour or so of travel. Ours was a mixed crowd indeed. Most obviously, there were a number of Brits on a package holiday headed for an Alaskan cruise out of Vancouver. Almost without exception, the men all had sophisticated, brand-new photo equipment that likely cost a mint. Many of them kept their cameras around their necks the entire journey, fondling the buttons or polishing the lenses in-between occasional “clacks” of the shutter. I had to smile at the sight of two “out” middle-aged homosexuals and a rather golden-aged transvestite in a skirt who got on in Northern California. They enjoyed a long conversation directly across from an outspokenly conservative retired Houston police detective and his family. While the detective may have sat with his arms crossed and thrown the occasional glare their way, in truth there was no real tension on either side and everyone was smiling soon enough. The train is neutral territory. Two of the first travelers we met included a grandmother shepherding a precise 11-year-old girl from Los Angeles back to Klamath Falls, Oregon. The girl was a proper conversationalist, and told a hilarious story about her brother and a friend playing in the family’s above-ground pool. “They were rough-housing,” she said, being rough enough that one of the pool’s walls collapsed, launching a small tidal wave—and the boys—out of the hole and smack into a fence. She said her dad couldn’t stop laughing. Another couple we met included a writer/photographer named Lee and his fiancé with whom we shared an enjoyable lunch, learning about his work and talking about politics, the journey and all manner of other topics. One unfortunate passenger spent the entire trip motion-sick in her roomette, while another 30-ish woman entered the parlor and announced rather loudly that her husband wasn’t joining the crowd because he was stuck in the bathroom suffering from horrendous… well, you can guess. When the poor guy entered the parlor 30 minutes later, he had no idea why everyone was trying to hide a smile. This March, a writer named Andy Isaacson wrote a piece for The New York Times in which he chronicled his first rail trip across the United States. Like me, he’s ridden trains in China and other far-off foreign locales but according to his article this was his first long-distance trek in the States. Like I did in my first U.S. train article, Mr. Isaacson tended to romanticize the trip overall, eventually finding that any actual sense of romantic tradition remains solely in the people on the train and the scenery rolling by. When it comes to the train itself, Mr. Isaacson mentioned it only to point out that the china in the dining car has been replaced with plastic plates, that the heat in his roomette failed and the attendant call button was broken so he froze all night, and that there’s no Wi-Fi—the last point a valid observation in that it is a rather commonplace (if modern) amenity, now available on many planes. In the end, even with the chair, I concluded that the view out of a train window is remarkable indeed and that the people you meet on board make the trip worthwhile. That hasn’t changed a bit since I left college—but neither has much else, and that’s a problem. The solution? Personally, I’d like to see a handful of multi-day trains run more like luxury cruise ships with cars designed and retrofitted to romantically classic standards but offering modern luxury amenities with points-of-interest stops and day excursions. I wouldn’t mind paying a bit more for such a service, but maybe I’m alone. Creating a modern and profitable train system in the U.S. is a problem better suited to smarter heads than mine. But until the romance returns to the rails, it seems writers like Mr. Isaacson and I will continue to draw similar conclusions. That is, for the money and compared to other developed countries’ passenger railroads, long-distance train travel in the United States has a lot to offer and remains a worthwhile experience in spite of one key factor: the train itself.